Don't be afraid to use the pan on the barbecue as if you were using a stove! Cooking nectarines on the barbecue gives them a delicious, caramelised taste. 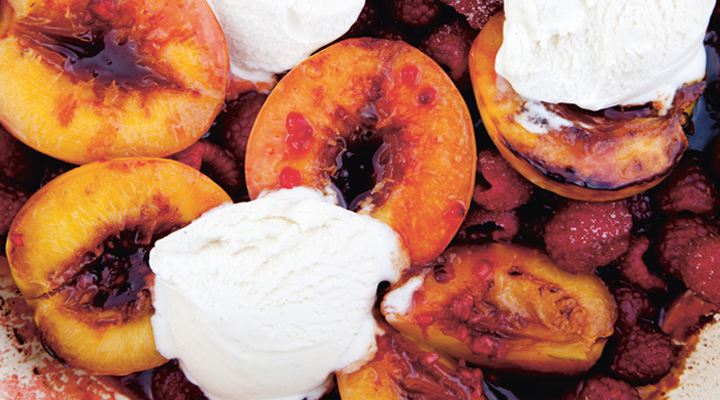 Served with ice cream, this recipe is the perfect dessert. Preheat the barbecue to a medium heat. Place the sugar, butter and orange juice in a pan. Place the pan on the heated barbecue and allow the juices to caramelise. Add the nectarines and vanilla pod to the pan. Baste the nectarines in the pan juices for 6 to 8 minutes, until softened. About a minute or two before serving, add the raspberries and cook for a further 2 minutes. Carefully remove the pan from the barbecue. Add the ice cream and serve immediately.